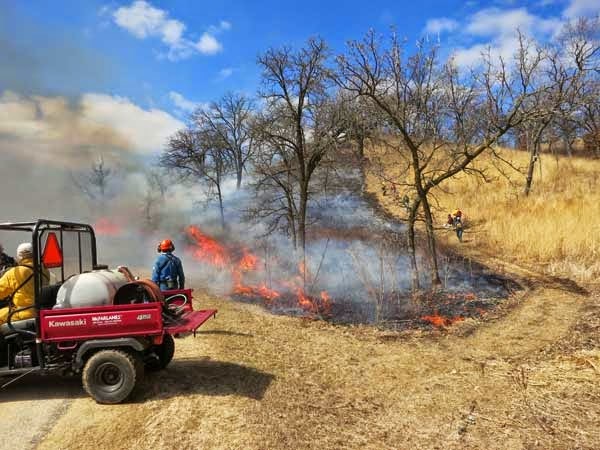 The weather finally cooperated and we were able to accomplish a large south-slope burn on Saturday March 29, 2014. However, the burn did not go the way I had anticipated. After a mild rain on Thursday the weather gradually cleared. Friday night the clouds vanished and Saturday dawned clear and sunny. 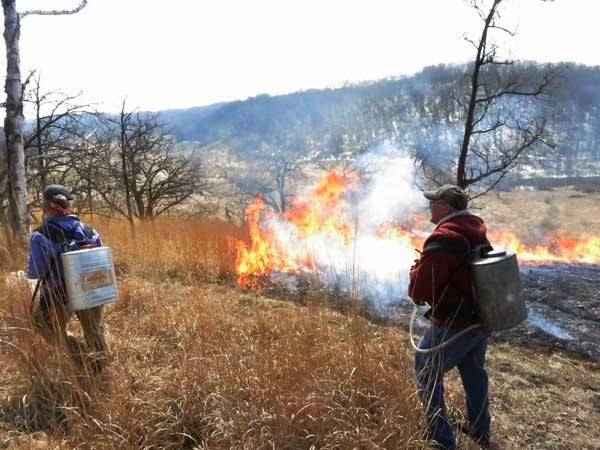 By 10 AM, when we assembled for the burn, the humidity was about 50% and temperature 45 F. Our lush fuel, primarily little bluestem and Indian grass, quickly dried off. We have burned this steep hill many times but this was the first time we had to start at the opposite end of the ridge. Lighting started at the top, at what we call the Far Overlook, backburning down the hill. The line moving west started down the ridge almost immediately, and had the west end tied off very soon. The long line moving east took much longer. Backburning down the south slope at the start of the west-moving line. Half way along the long east line, backburning through a prairie remnant lush with tall Indian grass. Lots of water was needed here to keep the fire from creeping into the savannas above. Near the end of the long east line. Denny's Polaris ATV was able to navigate the rather tricky side slope of the fire break at the top of the hill. Kathie ran the Kawasaki Mule with pumper unit (see photo below). At the east end of the ridge it was necessary to tie off the burn unit adjacent to the Basin Savanna. Kathie backed up the hill along the break so that the hose of the pumper could wetline the whole break. In addition, six crew members had water backcans to take care of any spot fires. 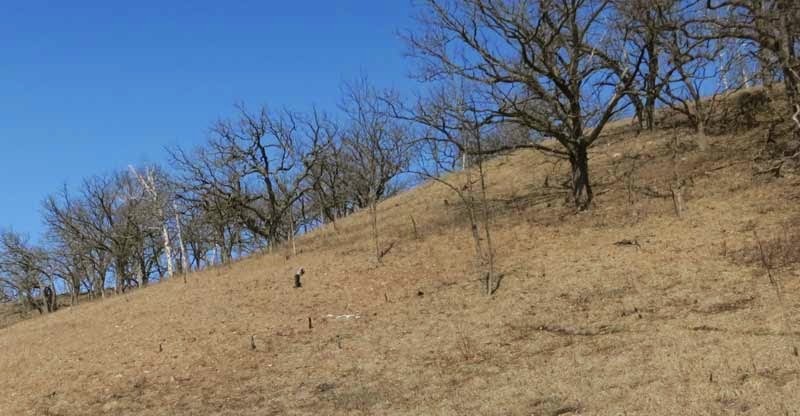 Although most of the fuel was warm-season grasses, the areas under the bur oaks near the top of the hill were too shady for grasses. Although the sun had dried them off, they burned in typical savanna fashion as a slowly moving line of ankle-height flame. Thus, the burn crew had to contend with alternating areas of high and low flames. The whole burn, 15 acres, took 2 hours to complete. After lunch we burned 10 acres of planted prairies. 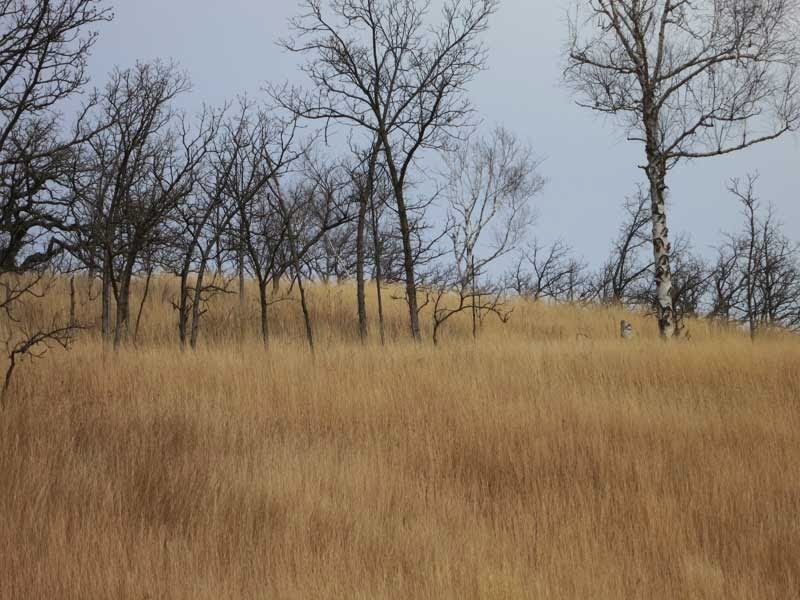 Just now, before our savanna burns begin, is a good time to observe the results of long-term restoration work. 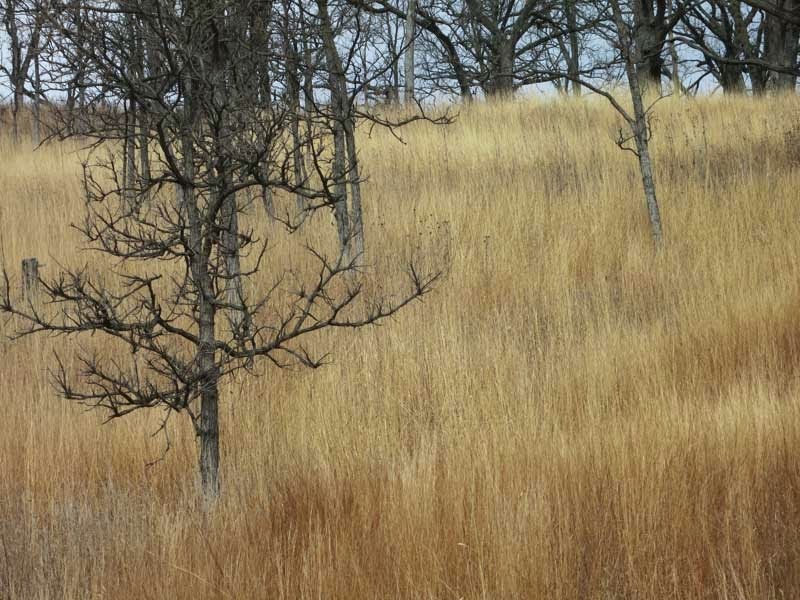 The photo shows how clear and clean our White Oak Savanna (Unit 12B) looks. We started brush removal here in January 1999, and burns began the same spring. 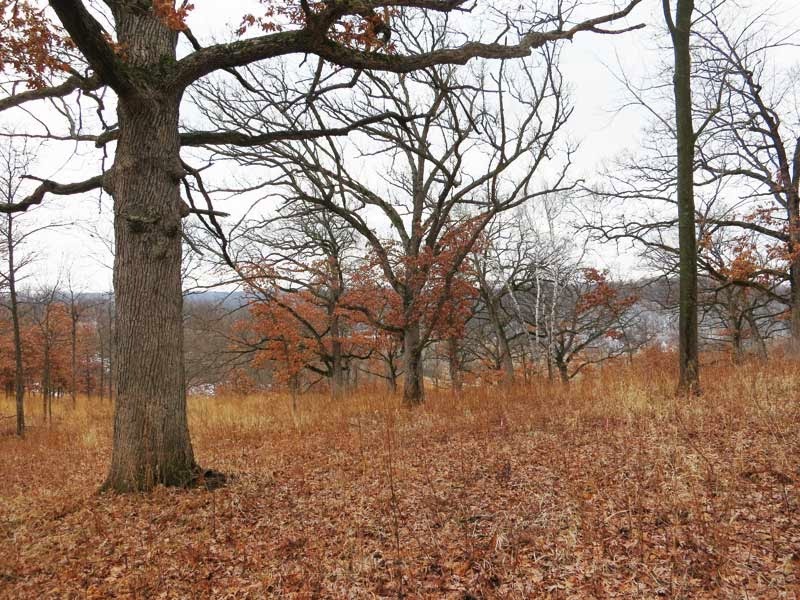 When restoration began, the brush was so dense (mostly prickly ash and honeysuckle) that you could not see one tree from another. Cutting and burning cleared it out, but it was essential to return every two or three years and remove root suckers and new growth from seedlings. Sumac was also a problem, and eradication of this pest required persistent herbicide treatment of all clones..
Now it is almost impossible, even with a careful survey, to find any trace of invasive brush. It was in this area that our first purple milkweed, a State endangered species, arose. Later other populations arose nearby, and in other parts of the Conservancy. 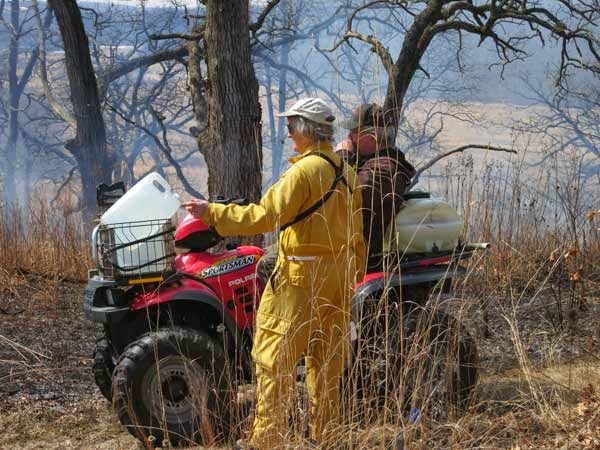 Oak savanna experts recommend annual burns for at least 10 years after restoration is started. Fortunately, the area shown in this photo burns well, so that there has been no difficulty in following this procedure. Note the nice carpet of oak leaves, which are the principal fuel for a savanna burn. Walking through this area now is a joy! Burn weather will eventually come and we have to be ready. The south-facing slope is always our first burn because it dries out early. This year requires some careful planning because the grass is very long, meaning a potentially hot fire. Quite a contrast to last year when the grass was so short we had difficulty getting it to burn. Why the difference between these two years? As you may recall, the year 2012 was the year of the summer drought. There was no rain in June, which is the main part of the growing season for grasses. By August, when we finally got rain, it was too late to save the grasses. Very short leaf bunches and practically no flowering. The first photo, taken in early 2013 (just before the spring burn), shows what the grass looked like. We mostly used a head fire to burn; even so, the fire moved slowly up the slope. On the other hand, the summer of 2013 was very favorable for grasses. Lots of lush green which has now cured to a golden brown. The second photo shows what we will have to contend with in our upcoming (2014) burn. The other photo is a closeup, which emphasizes how tall the grass is. With this much grass, a very hot fire is possible. This closeup photo of the south slope was taken yesterday. Our main task is to burn the grass without torching the trees. Although the bur oaks are notoriously fire-resistant, we still have to worry about fire in the canopy. The upper branches, especially of the large open-grown oaks at the top of the hill. are very difficult to put out once they get going. One solution would be to burn the whole slope as a backburn. However, that would take a long time, and because backburns move slowly, the heat stays around the base of each tree for a longer time, which, with the heavy fuel, would lead to lots of burn scars. Instead of a backburn, we will use the strip headfire technique, and keep the strips close together so that the flame heights remain low. The rule is that the farther apart the strips are, the hotter the burn. Why? Figure it out. We start at the top, of course, and backburn a wide blackline first. Once that is well established, then the strip fires can begin. A strip headfire will take more personnel than a backburn, but will be quicker and lots easier to control. The burn boss will have to be on his or her toes, but everyone on the burn will have a radio, and there will be a monitor in a UTV on Pleasant Valley Road moving back and forth and keeping track of the strippers. 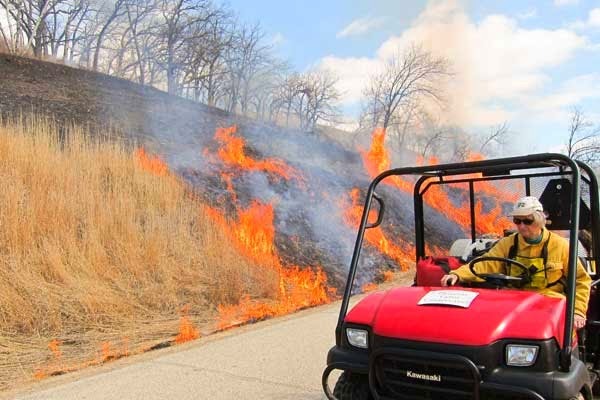 Normally, it takes about 2 hours to burn the south-facing slope (about 20 acres). Although small, the American kestrel (Falco sparverius) is a feisty bird that throws its weight around with fierce intensity. It's one of the most colorful birds of prey. I've always loved that it found a place on the 1 cent stamp. 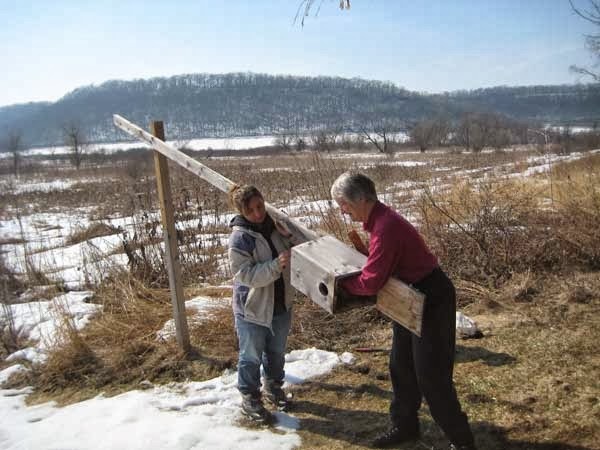 We installed three kestrel nest boxes in 2008 using Madison Audubon's design, and have had good nesting success every year since. We have ideal kestrel habitat, wide open territory with good perches in the savannas and woodlands nearby. They swoop across the open fields, sometimes using the wind to give them lift while they hover. Their primary foods are insects or other small prey. Most kestrels in our area probably migrate south in the winter, but return about the end of February to find nesting sites. They like high sites to nest, and our boxes are about 15 feet off the ground. As the photo below shows, the support is articulated so that the box can be brought down for cleaning. After scraping out the old debris, we put in a load of fresh wood chips. 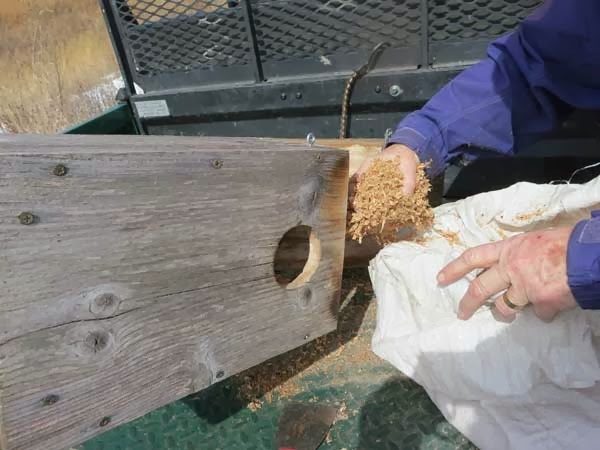 Putting fresh wood chips in the nest box. Unfortunately, we had a tragedy this year. 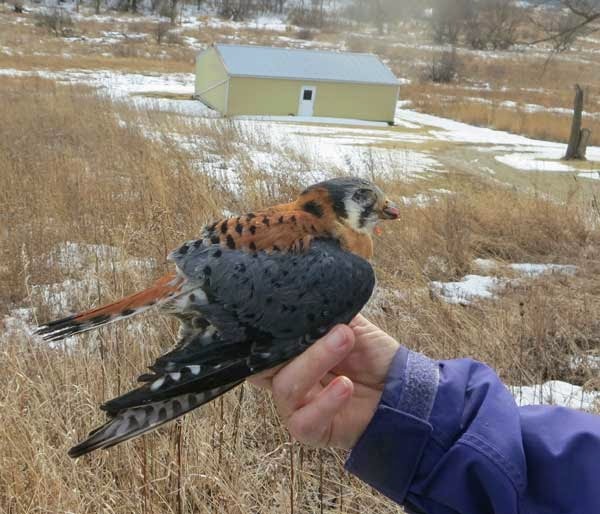 Just outside the barn, Kathie found a dead kestrel lying on the snow. It probably got killed flying into the side of the barn. Although this was a sad sight, it did give us a chance to see a kestrel up close. As I discussed in an earlier post, Google Earth has some up-to-date imagery that is not available through other sources. 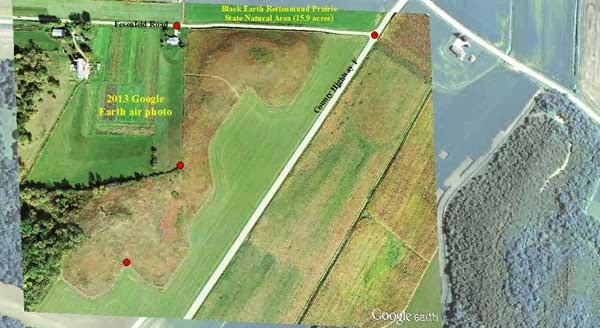 I found the image of the Black Earth Rettenmund Prairie area especially useful once I figured out how to tweak the image. With Google Earth select just the area you want. I turned off all the labels and icons so that I had a pure image. Also, F11 will give you a full screen. Click on the icon for Save Image and put the image in a folder. Open the image in Photoshop (or other software) and fix the brightness and contrast. This was important for me because my image in Earth was dark. However, all the detail seemed to be there so I did not lose anything by making these adjustments. Open the Georeferencing toolbar. I find it preferable to turn off the Autoadjust button. Bring the Google Earth image into Arc. If necessary, click Fit to Display to bring the image on the screen with the reference image. Use the Arc Effects tool to adjust the transparency of the Earth image. Move it around so that the points to be used for georeferencing are near those of the reference image. You want to be able to see the reference points on both images at the same time. Using the Georeferencing tool, put in control points. Click on each red dot first, then click on the same location in the reference. For a small image, such as the one I have here, only 3 or 4 control points are necessary. Click Update Georeferencing in the Georeferencing tool. The Earth image should line up with the reference image. The center of the image below is from Google Earth and the border contains part of the 2010 ortho-photo. The details of the image, including when it was taken, are given when you click View>Status Bar in Earth. My photo here is fairly small because of limitations of the web, but my Google Earth image was so sharp that I could see every fire break, every footpath, and every fence line. I was able to draw the best map of Rettenmund Prairie I have ever had. I don't know the source of this October 2013 image, and I could get no information from the Wisconsin State Cartography Office about it. I don't guarantee that all parts of Dane County have such a good image. In posts from earlier years, I have discussed solar radiation on steep slopes and its effect on snow melt, vegetation, and burns. 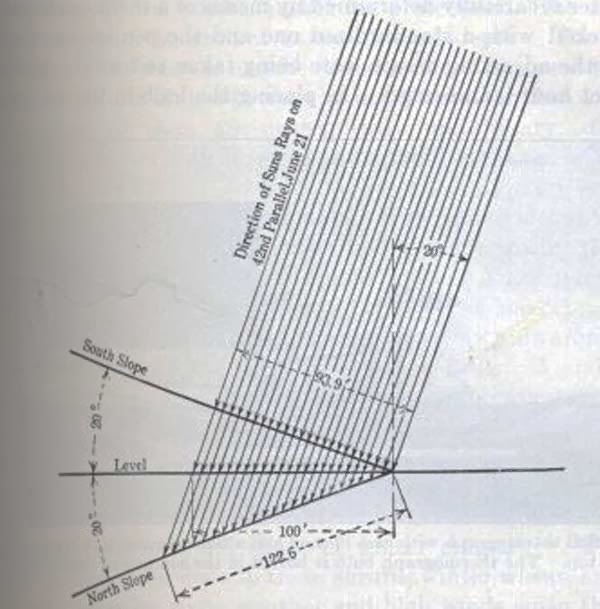 Because the sun and earth constitute a predictable system, it is possible to use a computer model to calculate solar energy input to any slope. The best paper I have seen dealing with vegetation is by Holland and Steyn published in 1975 in the Journal of Biogeography (Vol. 2, pp. 179-183). However, there is a vast literature from the solar electrical/heating field that might be relevant. The situation is obviously complex, although formulas exist that permit calculation for any of these four factors. 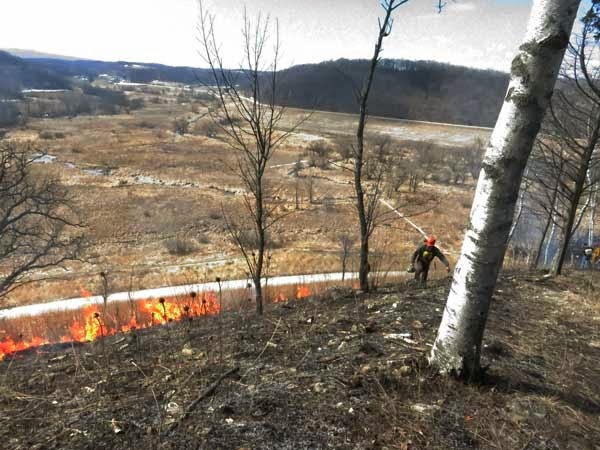 Because of the increased warming (and hence increased snow melt) on slopes, it is possible to burn south slopes even when snow is still evident elsewhere on the site. We did an early burn when snow was all around in year 2002, in the early years of our restoration work. We burned the whole slope as a head fire, lighting along the bottom of Pleasant Valley Road. The fire roared up to the top and then went out as soon as it reached the more level area where snow was still present. 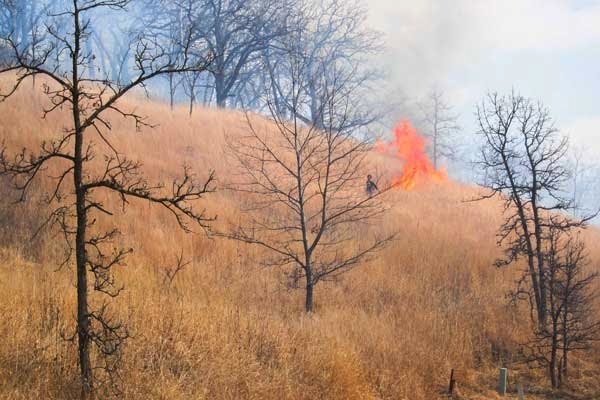 Although this was an easy burn to do, in retrospect it was a mistake to do it as a head fire, as flame heights were too high, especially in the bur oak savanna near the top. If we were to do this burn again in the future, we would do the upper part of the slope as a back burn.